This marks the first time in a number of years that I will not be in attendance at Gen Con. With it just one week away, I have hanging my head in sorrow thinking of the games I am going to be missing. Fortunately there is an amazing Gen Can't community for those of us who can't make the trip to Indiana. There are also some great games to keep an eye on and I am sharing five games that should be well worth your time at Gen Con. 1. 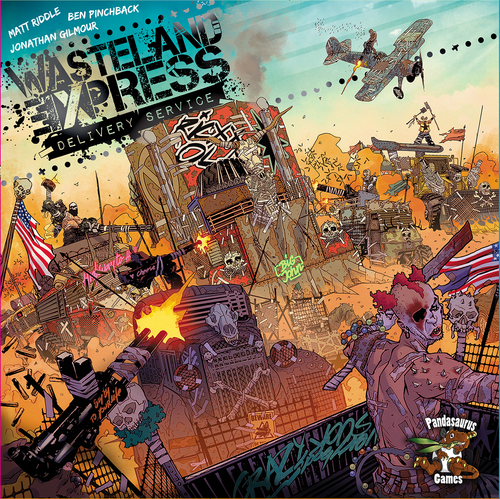 Wasteland Express Delivery Service by Pandasaurus Games - I have had the good fortune to have played this game a couple of times and am thrilled that it lives up to the hype. This pick-up and deliver game is set in a Mad Max-esque wasteland. The world has burned to the ground and competing factions are vying for control. You work for the Wasteland Express Delivery Service, a brave delivery company who deliver food, water, and weapons to and from various cities and encampments. There are a lot of moving pieces to this game, from customizing your truck for battle and keeping an eye on the supply and demand of goods, but turns are lightning quick and the gameplay is extremely intuitive. Featuring some of the best art, literally the best insert you will ever see (custom Game Trayz that make setting this game up a joy), and a good mix of humor, this game will see your table frequently and provide endless hours of entertainment for your gaming group. It is also sold out at the distributor level so this is a great chance to pick up a copy and avoid waiting for the second printing. 2. Edge of Darkness by Alderac Entertainment Group - When I first learned about Mystic Vale and its card crafting, I was convinced it was merely a gimmick. After giving the game a chance, I realized that it made for a very interesting game mechanic and allowed you to craft a deck that allowed you to cycle your new abilities much quicker than a traditional deck builder. AEG hinted at a future game that featured this mechanic, and Edge of Darkness will be at Gen Con in one form or another and I am stoked. Featuring worker placement, card crafting, and shared deck building, Edge of Darkness puts players into powerful guilds who are attempting to rule the city. It is semi-cooperative, as guilds must work together to fight the darkness, but also are working against each other for control. Not much else is known about this title. I am not sure when the official release date is, but I am guessing that will be revealed at Gen Con and I am looking forward to learning more about this title. 3. 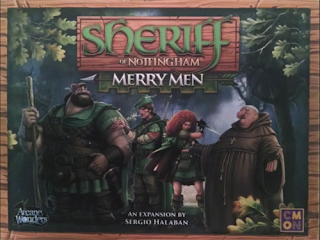 Sheriff of Nottingham: Merry Men by Arcane Wonders - I was tickled when I learned one of my favorite party games was getting an expansion. To be honest, Sheriff hasn't seen the table in my house for a while and I am hopeful that this expansion will breath new life into it. In Sheriff of Nottingham, you attempt to bring in legal and illegal goods to Nottingham. It sounds easy, but each bag is subject to search by the Sheriff, but you are welcome to lie and bribe your way to victory. The expansion adds deputies (bumping the max players to 6), Merry Men (illegal goods that provide special abilities when smuggled in), a black market (additional bonuses for smuggling), laws (special rules that change from round to round), and special orders (bonuses for certain combos). While none of it sounds groundbreaking, the game is good and doesn't need anything major to breath new life into what was once a stable at game night. 4. Whistle Stop by Bezier Games - I am surprised to put another pick-up and deliver title on my list, but I have heard a lot of hype about this game and am very curious to get it to the table. 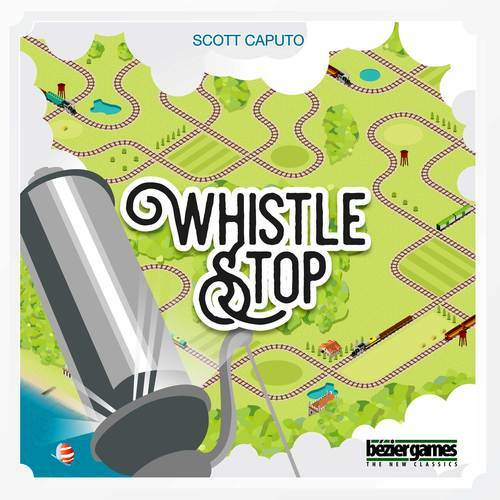 Featuring tile laying and pick-up and deliver, players in Whistle Stop are working their way west, building routes and a network in order to be the most profitable railway in the US. Players are faced with choices that include delivering goods farther for a greater reward, and choosing to optimize their route or block a competitor. Trains are a tried a true gaming theme and this looks like a good game for those looking to ride the rails in a game that is heavier than Ticket to Ride. 5. 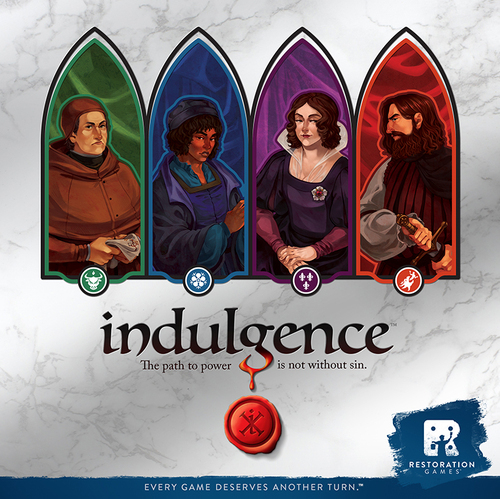 Indulgence by Restoration Games - A restoration of the Milton Bradley game Dragonmaster, Indulgence is a trick taking game for 3-4 players in which players attempt to violate edicts that are established for each hand. This "sinning" allows a player to seek an indulgence to relieve their sins. A Catholic re-skinning of a dragon themed game seems extremely odd to me, but the nuances of trying to commit the right "sin" during gameplay sounds like it could be a lot of fun. Definitely a title I want to check out to see if it is a good fit for a lighter gaming crowd.